These SPEs (screen printed electrodes) feature a carbon working electrode impregnated with bismuth oxide, along with a carbon auxiliary electrode and Ag/AgCl reference. These electrodes are disposable and are meant to be replaced after a set of runs (standard additions and sample). Thus each sample is afforded a clean and reproducible surface for analysis. After an initial reduction, the bismuth oxide is converted to metallic bismuth which can amalgamate with many heavy metals, thus facilitating anodic stripping voltammetry (ASV) experiments - no mercury electrode required!!! 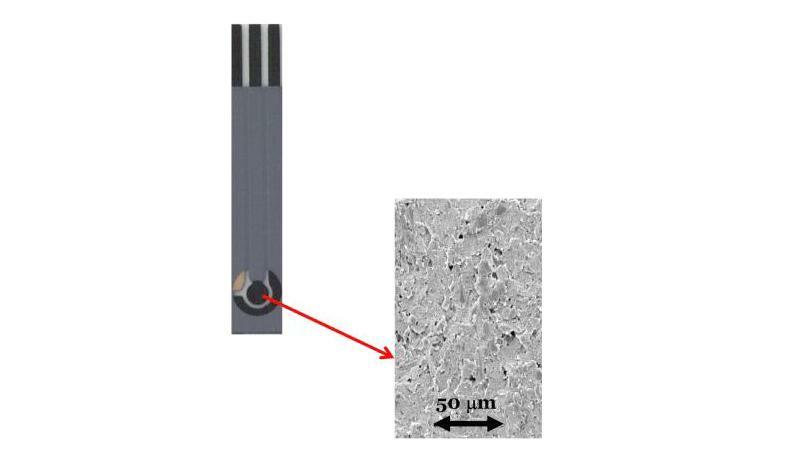 Disposable bismuth oxide screen printed electrodes for the high throughput screening of heavy metals. R.O. Kadara, N. Jenkinson, and C.E. Banks, Electroanalysis, 21, 2410 - 2414, 2009. In situ bismuth film modified screen printed electrodes for the bio-monitoring of cadmium in oral (saliva) fluid. M. Khairy, R.O. Kadara, D.K. Kampouris, and C.E. Banks, Analytical Methods, 2, 645 - 649, 2010. Disposable Bismuth Oxide Screen Printed Electrodes for the Sensing of Zinc in Seawater. Mohamed Khairy, Rashid O. Kadara, Dimitrios K. Kampouris, Craig E. Banks. Electroanalysis, 22, 1455–1459, 2010.